We've all got that one friend who is convinced that the apocalypse is almost upon us - whether it be zombie, disease or nuclear war based - and has a part of their house set aside for storing provisions. We all laugh and make fun of them, but if the dreaded day comes, their house is the first one we'll be heading for. 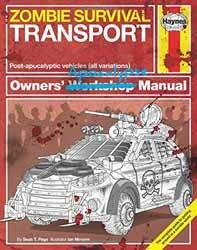 Haynes's Zombie Survival Transport: Owners' Apocalypse Manual is a beautifully presented tongue in cheek look at how to ensure your vehicle is ready for the imminent zombie apocalypse. It provides information on the different kinds of zombies and their speed; how to convert your car / motorcycle / animal to ensure you have the best chance of survival. The text is broken up by humour illustrations that are similar in style to those information sheets on trains and planes that tell you how to act in an emergency. This is an amusing book that is great to dip in and out of. It's probably more of a gift purchase than it is a book you'd buy for yourself.